Willa Cather wrote some of the most unforgettable fiction of the 20th Century. She also wrote thousands of letters. People thought most had been burned. Yours, Willa Cather is a 30-minute documentary inspired by the recently published Selected Letters of Willa Cather, edited by Andy Jewell and Janis Stout. 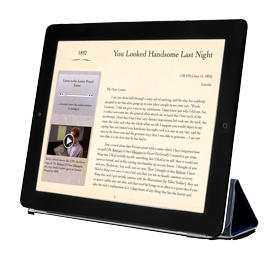 This companion iBook features eleven letters, read by Nebraska-born actress Marg Helgenberger of China Beach and CSI fame. In Yours, Willa Cather, we hear a voice different from that of Willa Cather the great novelist. Instead we meet a person who is vulnerable, funny and at times, ruthless. A fascinating woman who thoroughly mastered the art of letter writing. Available for free on iPads, iPhones and Macs on iTunes and iBooks.